If you love vintage style but are in the process of building a brand new home, there are many ways to create the nostalgia of historic charm. Think about what makes old homes so unique. It is often the one-of-a-kind look of being pieced together over the course of time. You can achieve this vintage look in your new house by selecting inconsistent window styles, adding an enclosed, wrap-around porch and using varying types of natural wood throughout the home. Planking, exposed beams and the incorporation of bead board, salvaged wood and reclaimed doors with glass knobs will create the homey comfort of days gone by. Applying thinned paint on walls, ceilings and cabinetry can create an authentic, vintage look throughout the house. 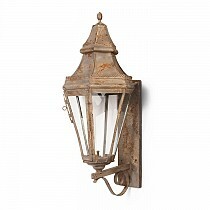 All your lighting can reflect the past with your choice of electrified lanterns, rewired antiques and handcrafted vintage reproduction fixtures. Old-fashioned pull chains and push button switches complete the look. By carefully planning your interior fixtures and finishes, you can create an authentic, vintage look in your new home before you move in!